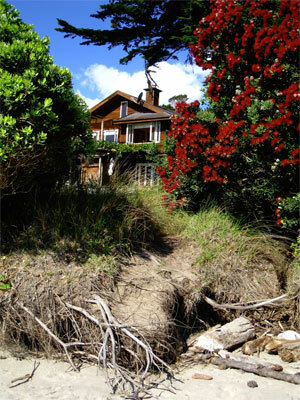 Hokianga Haven is just three and a half to four hours leisurely drive from Auckland through rural countryside and occasional villages. Come down the hill into the village, past the Copthorne about 2 kilometers, the driveway entrance is just before the two 50K signs on the harbour side. Routes through Whangarei or the western side through Dargaville will give diverse country side either way. Tane Mahuta, the celebrated giant kauri tree in the Waipoua Forrest is north of Dargaville. A favorite visitors stop-over on the trip between Omapere and Dargaville. 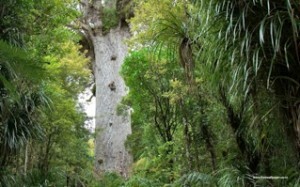 Tane Mahuta in the Waipoua Kauri Forest. It is the “King of the Forest” sometimes also named “god of the forest”. The tree is 50 meters high and about 2000 years old. Only twenty minutes drive from Omapere.